In Brass Legionnaire, new recruit Julius Brutus Caesar and his royal commanding officer Constantine Appius fought to save the city of Brittenburg from total devastation. Now, Rome looks to avenge the actions of the Nortlanders and invades the north. But saddled with political oversight, inept leadership and a resourcefully cunning enemy, the expedition walks a fine line between glory and destruction. With their technology failing, it will be down to swords and shields in the next novel of the Steam Empire Chronicles, Copper Centurion. 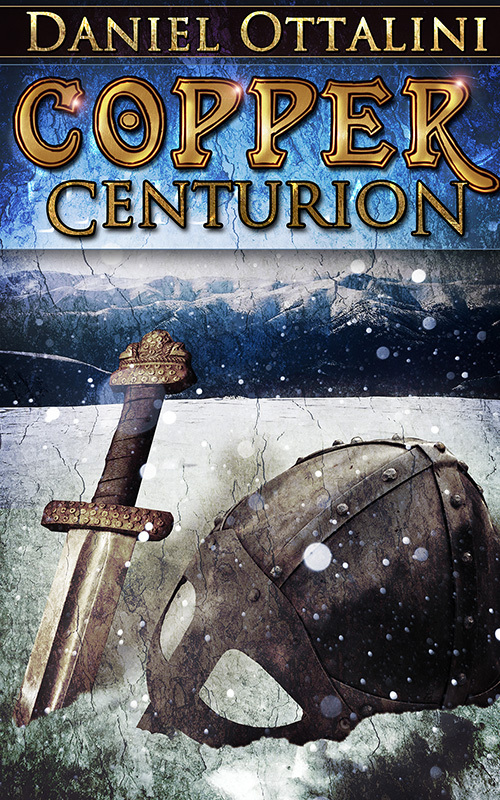 Copper Centurion is available on Nook, Kindle, and through Smashwords in every other format. You can also purchase a paperback version (Because retro is in!) through Createspace and amazon.com. The crisp autumn breeze swirled dust and kicked up dry leaves as it raced across the Cimbrian lowlands into the twisting streets of Copendrium, major port and capital of the northern province. The wind brought with it the scent of war and weighted the air with the tension of preparation. Centurion Julius Brutus Caesar walked down the narrow, winding Via Ecclesia, with its multitude of small shops and eateries. Otherwise known as Church Street, it wove through the heart of old town Copendrium. Dusk had begun to settle in, and the streetlights were flickering into existence, as lamplighters with long poles lit the gas lanterns every thirty feet. Pulling his red woolen cloak tighter around his body to ward off the chill, Julius paused at an intersection, his eyes straining to read the street signs. A nearby lamplighter must have seen his confusion, because the man walked over and held up his long tube lighter, illuminating the signs. Julius thanked the man profusely and tossed him a half-denarius for his trouble before continuing on the now-certain path. Julius stopped under the swinging sign illuminated by the flickering streetlights and lit windows. Decorated with a laurel crown circling a dancing maid, it identified the pub as the one he sought. He opened the ancient, well-worn door and the sounds and sights of the tavern washed over him as he entered. “Krystina, at your service. We have rooms, food, drink, and company, if you so choose, young man.” She flashed a sly grin. Her eyebrows lifted at the mention of a meeting. “Oh! You must be looking for the tribune. Right this way.” She walked out from behind the bar, squawking at a serving girl to take care of the patrons at the bar. The front end of the inn was a wide serving area, with a bar at one end by the door, and a multitude of tables and chairs pushed haphazardly together by different patrons. Voices filled the room, making it loud, but not deafening. Through this tangled maze Domina Krystina led Julius, deftly maneuvering around tables and visitors, her ample frame always moving at the last second. Not one drop of wine or beer was spilled, nor one patron jostled without a kind word of apology. Julius, on the other hand, had nearly upended several serious card games and emptied two different glasses of drink by the time they had crossed the room. He left several muttering and cursing customers in his wake. At the back of the common room were several closed doors. She opened one of them and gestured him through. Julius stepped out of the smoke and noise of the common room into a private meeting room, its walls paneled, intricately carved beams supporting a ceiling of some dark wood. To his left, several men lounged on chaises or in high-backed chairs near a large fireplace that dominated that end of the room. Its metal chimney hood was blackened with age and soot, and looked as if it hadn’t been cleaned in ages. The other light in the room came from dangling gas lanterns, which helped to banish the flickering shadows from the fireplace. A slender figure swathed in a long cloak stood apart, looking through the windows on the opposite side of the room at the dark streets. Domina Krystina bowed slightly, and announced Julius. “Thank you, Domina. That will be all that we are needing,” Tribune Constantine Tiberius Appius said from the chaise where he lounged with his back to the fire, his chin resting on his fist. “Come in, come in, Centurion. Looks like it’s getting cold outside,” he added as the younger man took off his cloak and hung it by the door. Julius squared his shoulders and mentally ran down his report. Taking a breath, he began. His words flowed into the room, with only the crackle of logs in the fireplace and the occasional crunch of chewing punctuating his words. “I reported in at the post to check on the men. As of today, the IV Britannia and the III Cimbrian have arrived; they were setting up their quarters when I left. With the XIII and VII Germania already here, we are simply awaiting the arrival of the Northern Aerial Division under Air-Admiral Polentio. This includes the H.M.A.S. Scioparto, fresh from a retrofit.” He paused as Tribune Appius interrupted, waving his hand. “Excellent! We’ll be able to see Captain Alexandros again. Mighty fine job he did, last time we worked together.” The statement hung in the air for a moment, as the other officers nodded in agreement. “With the air-admiral’s ships and our men, we should be in Midgard by the Winter Solstice!” he boasted, the red flush in his cheeks betraying the amount of wine he had imbibed. Fists clenched, Julius snarled, “We’ll pay them back for every life they took in and then some!” He didn’t try to keep his anger and hatred from his voice, and the others looked at him. Tribune Appius stood and extended a fresh goblet of wine to him. Julius grasped it and drank deeply, the liquid pushing the sudden tightness from his throat. Julius was having trouble masking his emotions. He clamped down hard on the turbulent rush of anger, sadness, and frustration boiling just below the surface and managed to mutter thanks. “Although it may not seem like it, I know how you are feeling. My name is Senatora Octavia Pelia. I’ve been tasked by the Senate War Committee to be their observer for your mission. And because I know what you’re already thinking about civilians messing around with a military operation, I am here strictly as an advisor, not a leader. My father was Senator—and General—Horatio Pelia, victor of the Battle of Vilnus and the Seven Woods War. I’ve lived near the northern frontier my entire life, and I’m one of the foremost experts on the Nortlanders—their culture, language, and history.” She paused, looking around at the military officers. A few seemed a bit startled by the amount of background and information she was bringing to the table. Others could barely contain looks of annoyance at having to put up with the military’s foremost evils: women and politicians. Ignoring the looks on the men’s faces, the senatora walked into the center of the room and appeared ready to start again, when shouting and loud voices raised in argument in the common room interrupted the quiet of their private room. There was a pounding on the door. “Centurion, see to it,” the tribune barked. Hand on sword, Julius turned and moved to open the door. He looked out at two large men with the look of street toughs who were tussling with a smaller, weasel-like man as Domina Krystina looked on. The toughs appeared to have it under control, when the man slammed his skull back, breaking the nose of one of the enforcers. Dazed, the man lifted one hand to try to staunch the blood pouring from his nose. Twisting from his grasp, the small man spun around and slid out of the arms of the other enforcer. He pushed past the innkeeper, knocking her down. An eavesdropper, Julius realized as he leapt forward, but he only succeed in catching the innkeeper, rather than his quarry. Cloak flying, the man raced through the busy common room, nimbly dodging tables and patrons. Julius managed to extricate himself from the weight of the innkeeper in time to see a flash of dark cloak as the man escaped from the common room, leaving chaos in his wake. Realizing there was no way he could catch up, Julius dusted himself off in disgust and returned to the private room. Julius dismissed her. Typical politician. I wonder why she is really joining our expedition. Julius shook his head, while the tribune nodded, looking confident and calm. Julius raised an eyebrow. Taking a port by air in the middle of a Nortland winter? He shivered with anticipation. Or was it anticipation of the cold? Julius accepted the glass, and the other men in the room moved in. The senatora remained to one side. Cool dark eyes surveyed the men as they lifted their goblets in a toast. The other men in the room, all officers who had seen their share of war and bloodshed, nodded solemnly.